John Bayless was born July 20, 1799, to Samuel Bayless and his wife Helena Cruser. He was the grandson of John Bayles and Susannah Burtis of Middlesex Co., NJ. His earliest American ancestor may have been John Bayles of Southold and Jamaica, Long Island, who arrived on Long Island in the 1600s. John Bayless married twice, his first wife was Almira Cooper who died in 1851. 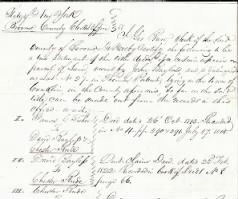 His second wife was Adelaid Corbett, daughter of Ira Corbett and Juliette Boze of Broome Co.
John Bayless served in the New York State Militia. It is said that he rose through the ranks to achieve the rank of Brigadier General. He was known as "Gen. John Bayless". 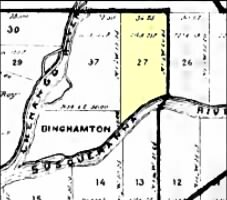 He purchased land in Broome Co. What was probably his largest plat of land was Lot. No. 27 in Conklin. It was on this lot that John established his farm. He also conveyed part of this lot to the Presbyterian Society of Conklin. 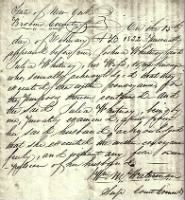 In 1844, John Bayless requested of the Broome County Clerk's office a deed and mortgage search regarding Lot No. 27. 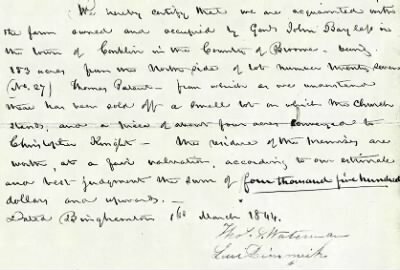 The results of this search were presented to the General on March 15, 1844, the same date on which he and his wife took out a $1,000 morgage on all of the lot save the part on which the church stood and about four acres that he had conveyed to Christopher Knight for a water privilege. I own several of the original papers of Gen. John Bayless. 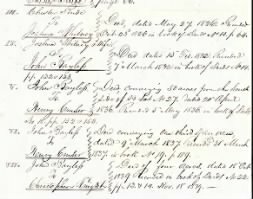 These papers include deeds, mortgages, business papers, etc. 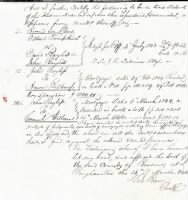 On this page you can view images of the deed and mortgage search that was performed at the General's request. 1 Broome Co. Plea - Gilbert Tompkins vs David bayless & John Bayless - Judgt for Peff(?) 4 July 1843 D $98.33 Costs 10.16 - D. S. & J. R. Dickinson attys. Deeds incumbrance that I find against the above described premises. Clark's Office , the whole title appearing a record. 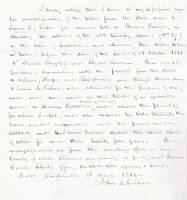 The following deed is quite large, too large to scan without damage. I was able to scan the two parts presented below which were written on the back of the Indenture. On the 15th day of February A. D. 1832 personally appeared before me, Joshua Whitney and Julia Whitney, his wife, to me known - who severally acknowledged that they executed the within conveyance for the purpose therein contained - and the said Julia Whitney, being by one, privately examined, apart from her said husband acknowledged that she executed the within conveyance freely and without any fear or __ of her husband. Lot No. 27 Thomas Patent, Broome Co.